Oh you went and got him to foster! Yippie Skippie. Know I know he is wonderful hands. He is a cute pie. Hope he is getting along well with the other two. Does he have heartworm then? According to the vet, he's very light positive. We're using the slow-kill method, treating with monthly Heartguard and 20 days of Doxycyclene. Thanks for springing him. He sounds like a wonderful dog. 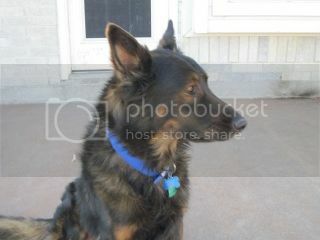 I think he would make a very nice companion for Rafi. Too bad Cleo doesn't agree. Is he as handsome in real life as he is on the forum? Handsomer. The pics really don't do him justice. He's a DARK sable with red undertones. I love his coloring. He sure looks happy. Congrats and thanks for helping him on to a better life. Few updated pics of Bandit. He's just a very good dog. 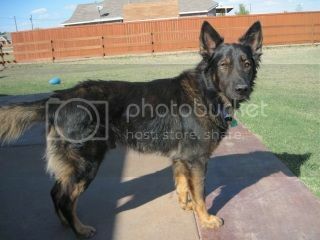 I think he'd make a perfect starter GSD.